Like most of life's pursuits, you can base your fishing success on random bursts of inconsistent brilliance, or the predictable opportunities of tactical proficiency. Take king mackerel - a popular sport fish that chews its way up the Gulf Coast during the warmer months and back southward in the fall. You'll hear occasional tales of bottom fishermen catching big kingfish on fluorocarbon leaders after the toothy fish intercepted a bottom rig on its way down to the grouper/snapper neighborhood. OK, it happens now and then, but don't bank on this - Scomberomorous cavalla sports a mouthful of sharp teeth that typically slice through anything they hit. Fast and efficient, kings don't leave a lot of room for error. For those actively seeking kings, a tackle-specific strategy will improve your odds of nabbing this wily predator. Specifically, anglers who intentionally target kingfish know the value of wire rigging, as metal stands up to sharp teeth much better than monofilament, or even fluorocarbon. Rigging wire comes in various sizes and anglers have to learn to gauge their selection based on bait size and water clarity. 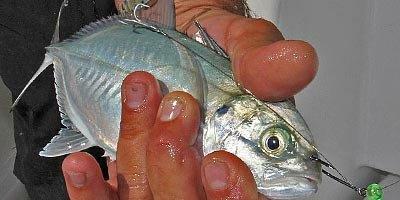 Smaller wire imposes less of a burden on baitfish so they swim better with less fatigue. Moreover, light wire is less visible in clear water. Coffee colored leader wire is usually best because it's less visible than shiny stainless steel wire. When targeting large "smoker" kings of 30-plus pounds, you can usually get away with heavier wire. For one thing, you'll typically use bigger baits such as blue runners, mullet, bluefish and menhaden. Also, bigger fish are typically bolder and they'll attack with reckless abandon. Ultimately, heavier wire gives you a better chance of withstanding the full-speed bite of a big king whose flashing choppers will occasionally sever light wire. For most kingfish duties along the central Gulf Coast, No. 3-5 wire will do the job. Experienced anglers carry coils of various sizes to cover whatever conditions they may encounter. Now, in any sport, an essential element of competition is the knowledge of your opponent's tactics. For kingfish anglers, understanding their quarry's feeding style provides insight into effective rigging. Kings may gobble smaller meals in one bite, but they'll typically attack full-size meals at top speed, immobilize their prey by slicing it in half or clipping off its tail and then swing around to gobble the remaining pieces. With this slashing strategy, a kingfish that hits a bait with a single hook in its nose will often avoid capture by slicing through its prey without ever touching the metal. Anglers tired of the king's larceny have learned to avoid such theft by presenting each bait on a stinger rig, which comprises a lead hook with a treble "stinger" hook dangling on a piece of wire attached to the first hook. Some attach their stinger segment to the eye of the lead hook, while others affix it to the bend. When a kingfish hits a stinger-rigged bait, the trailing wire pulls the treble forward and snares - or "stings" - the attacker. Because the stinger wire absorbs most of the strike force, it's typically a size heavier than the leader wire. Lead hooks are usually 2/0 in size and set through the bait's nose or forehead. Stinger hook trebles are No. 4-6 in size. No doubt, a plump, vulnerable baitfish will garner plenty of kingfish attention, but distance or low visibility sometimes prevents the hunter from spotting the prey. That's where kingfish rig attractants can prove helpful. Skirts made of nylon fibers with eye-catching Mylar strips are the common addition. Slipped onto the wire leaders, these "dusters" pulsate in the water, thereby increasing the bait's profile and flashiness. Some believe that hook color makes a difference. Red hooks may simulate blood - a natural attraction for predators seeking wounded prey. For shiny baits like ribbonfish, coating standard hooks with chrome spray paint allows the hardware to blend better for less chance of detection. However you chose to arrange your wire rigs, keep plenty of backups in clear plastic bags labeled to identify the specific size and configuration. Spare wire, swivels and hooks may also come in handy should you need to alter an existing rig, or make more when the bite is hot.